This PMR study offers an eight-year analysis and forecast for the global shiplifts & transfer systems market between 2018 and 2026. The shiplifts & transfer systems market study considers 2017 as the base year with market values estimated for 2018 and a forecast developed for the duration of 2019 to 2026. Compound Average Growth Rate (CAGR) has been represented from 2018 to 2026. This shiplifts & transfer systems study covers various perspectives of the market, including market dynamics, value chain, pricing analysis, competition analysis, regional and segmental growth comparison and macro-economic and shiplifts & transfer systems industry growth analysis, along with segment level projections in a comprehensive manner. 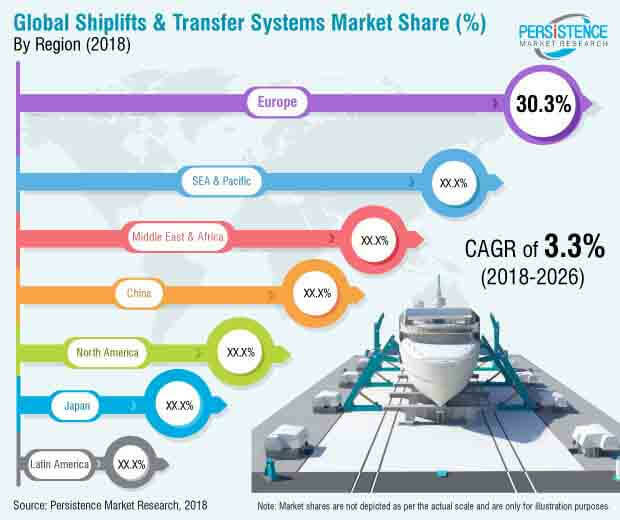 As per the findings of the study and perspectives of industry participants, the global shiplifts & transfer systems market is projected to grow at a CAGR of 3.3% between 2018 and 2026 in terms of value. Growing seaborne trade activities and maritime tourism are some of the factors positively impacting the uptake of shiplifts & transfer systems in the global market. PMR’s report on shiplifts & transfer systems carefully analyses the market at a global and regional level through market segmentation on the basis of key parameters such as type, end use, mode, ground condition and region. A shiplift is a large elevator platform that raises the ship out of the water for dry-docking ashore and lowers its back into water after the completion of work. It is also used to launch new ships from shipyards. The ship transfer system has electro-hydraulic trolleys, which are designed to transfer ships from shiplifts to dry berths on land. Shiplifts & transfer systems fall into three categories: winched, hydraulic lift docks & floating dock lifts. The shiplifts & transfer systems report is structured to facilitate the reader to develop a thorough understanding about the shiplifts & transfer systems market. The global shiplifts & transfer systems market report begins with market definitions, which are followed by the market background, market dynamics and market analysis by key segments, regional analysis and competition landscape. Each section in the global shiplifts & transfer systems market covers a qualitative and quantitative assessment of the shiplifts & transfer systems market on the basis of facts, historical developments and key opinions collected from industry participants through dedicated interviews and trends in the market. The global shiplifts & transfer systems market has been segmented on the basis of type, end use, mode, ground condition and region. The global shiplifts & transfer systems report begins with a market introduction, defining the market taxonomy and product definitions regarding the global shiplifts & transfer systems market assessment. In the next section, the report describes the market background, which covers macro-economic factors, industry factors, product life stage, forecast factors, value chain overview covering approximate margins, porter’s analysis, etc. The next section of the global shiplifts & transfer systems market report discusses market dynamics, such as drivers, restraints, trends and opportunities, impacting the shiplifts & transfer systems market growth at a global level. Subsequent sections of the report provide value (US$ Mn) and volume (Units) projections for the shiplifts & transfer systems market on the basis of the aforementioned segments at a global level. The global market values represented in these section have been agglomerated by collecting data and information at a regional level. Information provided on the global shiplifts & transfer systems market, along with key facts and insights, cover unique analysis frameworks, such as absolute $ opportunity analysis, year-on-year growth trend comparison, market share and attractiveness analysis for each of the sub-types covered under each segment. The next section of the report presents a summarised view of the global shiplifts & transfer systems market based on eight prominent regions considered in the study. The section includes regional market position, growth potential and market attractiveness analysis for each of these regions. In order to offer an accurate forecast, we started by sizing the current market, which forms the basis of how the global shiplifts & transfer systems market is expected to develop in the future. Given the characteristics of the global shiplifts & transfer systems market, we triangulated the outcome of three different types of analysis, based on primary research, secondary research and our own analysis. However, forecasting the market in terms of various shiplifts & transfer systems segments and regions is more a matter of quantifying expectations and identifying opportunities rather than rationalising them after the completion of the forecast exercise. In the final section of the report, a competitive landscape of the shiplifts & transfer systems market has been included to provide report audiences with a dashboard view categorised on the basis of manufacturer, their presence in the shiplifts & transfer systems market and key differentiating factors and strategies. This section includes market share analysis and tier structure analysis of the key manufacturers in the global shiplifts & transfer systems market. Detailed profiles of the providers have also been included under the scope of the report to evaluate their long- and short-term strategies, key offerings and recent developments in the shiplifts & transfer systems market. Examples of some of the key competitors covered under the shiplifts & transfer systems report include Bardex Corporation, Bosch Rexroth AG, Damen Shipyards Group, GANTREX, Larsen & Toubro Limited, Maschinenfabrik Bröhl GmbH, MTi Co., Ltd., Pearlson Shiplift Corporation, Ra In Ho Co. Ltd., Rolls-Royce Holdings PLC, Royal HaskoningDHV, TPK Systems Pte Ltd. and TTS Group ASA. A shiplift is a large elevator platform that raises the ship out of water for dry-docking ashore and lowers it back into water after completion of work. It is also used to launch new ships from shipyards. The ship transfer system has electro-hydraulic trolleys, which are designed to transfer ships from shiplifts to dry berths on land. Shiplifts & transfer systems fall into three categories: winched, hydraulic lift docks & floating dock lifts. The shiplifts & transfer systems market report covers comprehensive information about market trends, volume (Units) and value (US$ Mn) projections, market dynamics, competition and recent developments regarding the global shiplifts & transfer systems market for the study period (2018–2026). The global shiplifts & transfer systems market is expected to reach a little over US$ 774.5 Mn by the end of the forecast period, registering a CAGR of 3.3%. Advancements in manufacturing techniques and the strong outlook of the shipbuilding industry are expected to set a firm platform for the growth of the global shiplifts & transfer systems market. By type, the shiplifts & transfer systems market has been segmented into winched, hydraulic lift dock and floating dock lift. The winched type shiplifts & transfer systems segment is anticipated to dominate the global shiplifts & transfer systems market in terms of value during the entire forecast period. Shiplifts with winches are the most common shiplifts preferred by shipyard owners. As of 2017, the value of the winched type shiplifts & transfer systems segment was pegged to be about 1.9 to 2.1 times higher than that of the hydraulic lift dock segment. The hydraulic dock lift segment is expected to register 1.2X faster growth than the floating lift dock segment during the study period. Sea transport is cheap and more energy efficient as compared to other modes of transport. Currently, seaborne trade accounts for over 90% of the global overseas trade. As one of the important international trades in the world, seaborne transportation is estimated to play a pivot role in the world’s rapid industrialization and advancement, permitting the transportation of large volumes of processed and raw materials as well as water, food and other products. Growing seaborne trade activities across the developed and developing economics surge the demand for shipping containers and consequently, drive the global shiplifts & transfer systems market. Amongst all the modes analyzed in the global shiplifts & transfer systems market study, the flexible tire based segment is expected to hold a dominant share throughout the forecast period. The segment is estimated to register about 1.08X the overall growth in terms of value. Flexible tire based solutions allow more freedom to maximize the space capacity of shipyard compared to the rail based segment. Attributing to favorable macro-economic factors, it is estimated that new shipbuilding requirements will be on the rise, albeit at a low growth rate. This is expected to drive the growth in the demand for shiplifts & transfer systems. Asia Pacific is a major shipbuilding hub in the world. South Korea – a leading market for shipbuilding – has faced significant crisis in the recent past. The increasing orders for new ships create an optimistic environment and thus, the shipbuilding industry in the region is expected to recover. This will further surge the demand for shiplifts & transfer systems over the forecast period. China is expected to register 1.4X growth in the global shiplifts & transfer systems market, followed by South East Asia (SEA) & Pacific, Europe and MEA in terms of value. SEA & Pacific and China are anticipated to gain traction in the latter half of forecast period in the global shiplifts & transfer systems market, owing to fact that China plans to restructure some 70 shipyards. Among all regions, China and SEA & Pacific are expected to gain significant market value shares in the global shiplifts & transfer systems market by the end of the forecast period. Collectively, the Middle East & Africa and Latin America are projected to register a CAGR of 5.0% by value, which is 3.3X lesser than the collective growth of all other regions. The global shiplifts & transfer systems market is moderately consolidated with the presence of few global as well as regional players across the globe. Globally, the top 13 players in the global shiplifts & transfer systems market collectively hold between a 70% and 80% share of the overall market in terms of value. In the recent past, the shiplifts & transfer systems market has witnessed substantial developments from the competition perspective. Expansion, acquisitions and collaborations are some of the strategies opted by key players to expand and sustain in the global shiplifts & transfer systems market. Prominent players covered in the global shiplifts & transfer systems market include Bardex Corporation, Bosch Rexroth AG, Damen Shipyards Group, GANTREX, Larsen & Toubro Limited, Maschinenfabrik Bröhl GmbH, MTi Co., Ltd., Pearlson Shiplift Corporation, Ra In Ho Co. Ltd., Rolls-Royce Holdings PLC, Royal HaskoningDHV, TPK Systems Pte Ltd. and TTS Group ASA. How is the shiplifts & transfer systems market expected to take shape in terms of volume and value during the study period? How has the shiplifts & transfer systems market evolved over the past four years? What are the competition developments and trends in the shiplifts & transfer systems market? What are the prevailing market dynamics in the shiplifts & transfer systems market? What are the key challenges, opportunities and improvement factors for market players in the global shiplifts & transfer systems market? What are the underlying macro-economic and industry factors impacting the growth of the shiplifts & transfer systems market? How has the competition evolved in the shiplifts & transfer systems market over the past few years? What are the market positioning and key strategies of key manufacturers as per the market taxonomy in the global shiplifts & transfer systems market? Ra In Ho Co. Ltd.